Remember this top? The one I made in a knits class with unshrunk fabric? I sent it off to my sister (who reports that it works fine for her) and I've finally got around to trying again. I pre-washed the fabric this time and happily the finished shirt still has lovely long sleeves. I'm not 100% sure I've got the fit right, but at least this one is wearable. The armscye might not be totally right and there might be too much fabric in the back. It's hard to tell when I'm twisting around in front of a mirror trying to see it. I've also finished three of these tank tops. The pattern for these is self-drafted and based off of some tanks I have from Eddie Bauer. I finished the exposed edges on all three differently. Last one is the best one, naturally. No extra bulk but a bit more finished looking than just turning the raw edge in. 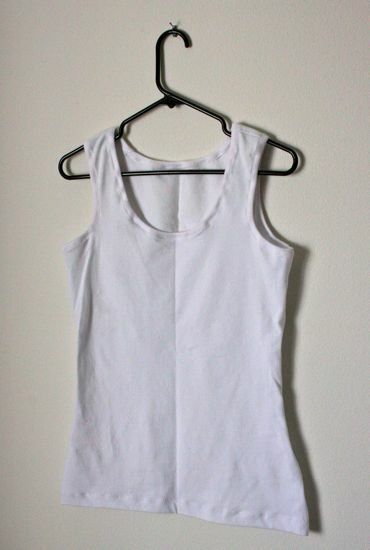 These tanks are intended for layering for winter warmth, not for regular (visible) wear. The fabric is a cozy but very snug dance knit; wearing one of these is a bit like having an all-day hug. Adding one to an outfit doesn't significantly change the look (minimal added bulk) but does improve my cold-weather comfort level. Hooray for being warm without looking like a walking pile of bulky sweaters! 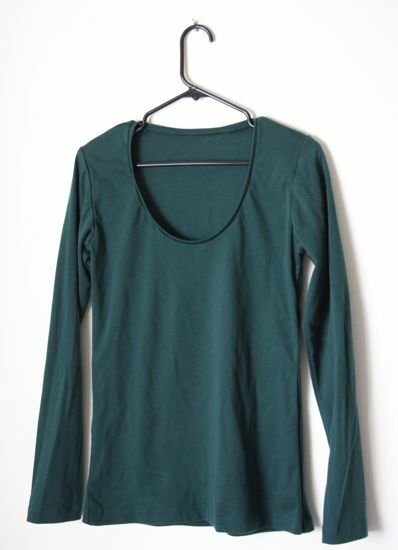 The green top is my first official project for my Wardrobe Improvement Project. It'll probably be a while before I get around to tackling the next project - Caitlyn's wardrobe needs more attention! Woohoo - you're an inspiration. I have so many patterns and so much fabric that I need to get on to. For finishing the neckline on knits I like using a folded strip of the knit, sewn on to the right side, raw edges together, and then folded back so the edges are against the wrong side. Then you can just use a double needle to stitch it down. In fact, double needles would solve your hem issues too. I have serger but it doesn't do coverlock so that's how I do them. Thanks! Sounds like our edge finishing techniques are pretty close. I'll have to try the double needle thing - thanks for the tip! I have one and I played with it once (on a woven) and found that it made more of a pintuck than a nice flat double seam. Maybe the effect would be different on a knit? Bravo! Looks good and feels good- winning combo. 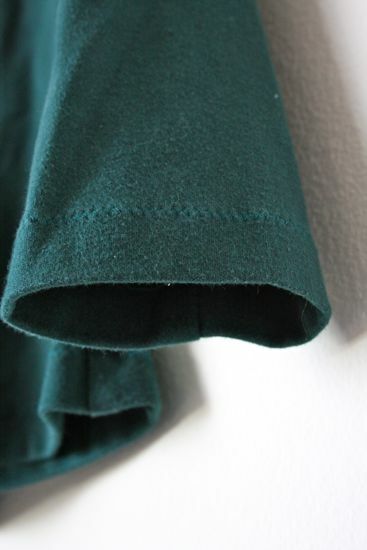 I got that pintuck effect on hems when using a double needle for hems with knit fabrics, too. What ended up working best for me was using 1/4" iron on bias interfacing tape I got from Professional Sewing Supplies in Seattle (206-324-8823) ‎to stabilize hems before stitching and also playing with the tension dial, I can't remember for sure which direction, but I think it was looser on top. Then pressing after sewing. I got the hems to look right consistently using these techniques before I finally broke down and invested in a cover-stitch machine. Once you start sewing clothes with knits, you never want to go back. 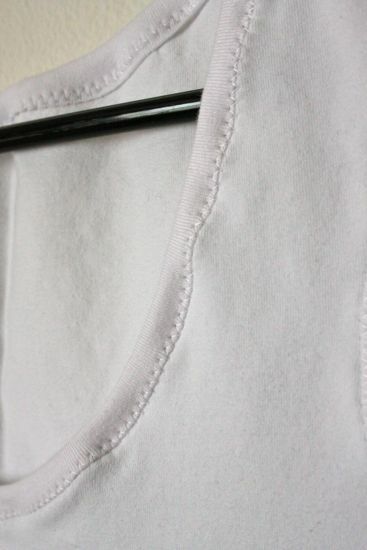 You're able to make a great looking t-shirt that fits how you want in an hour flat, no serger required. It's positively addictive. P.S. correction: the bias interfacing tape from Professional Sewing Supplies is 3/8", not 1/4". Sorry about that. Thanks! I'll play around with the next shirt ('cause there's always next time!) and see what I can come up with. Way to be "On Message"